Midi In - "Hello World!" Check out this video for a detailed Analysis of the Midi Circuit. For a real world look at this circuit in action, check out the NaV-1 Arduino synth construction series. Have you ever been working on a Arduino project and suddenly thought 'This thing could really use a MIDI Input'! This exact thing just happened to me. Not wanting to re-invent the wheel, I began searching around for a Library that would help. I came across the Arduino Midi Library which seemed to fit the bill. It took me a while to actually get the thing going, so I thought I would write a quick post outlining the steps to get a simple test circuit working. 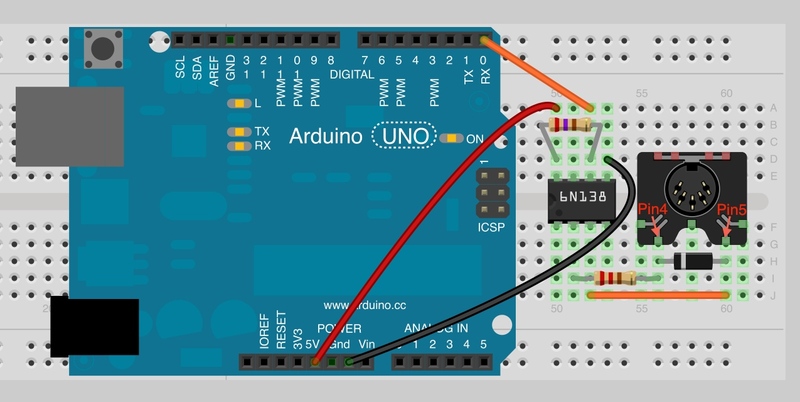 The following program and circuit will simply Flash the LED connected to Pin 13 on the Arduino Board when you press a note on a Midi Keyboard. But, that's really all you really need to confirm that you are correctly receiving Midi commands with your Arduino. Flashing LED means you Win!! First go to this Link and download the Arduino Midi Library files. Unzip the downloaded folder. There are two folders inside. For Windows, copy the folder called "MIDI" and paste it into your Arduino "libraries" folder. Mine was located inside the "arduino-0022" folder. Quit and restart your Arduino IDE program. Go to the Menu and open Sketch > Import Library. You should see "MIDI" as one of the choices. Copy and paste the code at the end of this article into a new Sketch. The code is commented, so give it a quick read through. This initializes the Midi Library. The MIDI_CHANNEL_OMNI parameter sets the library to listen to all Midi Channels. MIDI.begin(2) would set it to listen to Channel 2 only. This is an import command! The Arduino Midi Library uses something called 'Callbacks'. When a Midi event occurs, the Library will Call a function to handle it. This command tells the Library to call the 'MyHandleNoteOn' function when a 'Note On' Midi event is detected. There are many callback functions in the Library to handle the many types of Midi events (Clock, Pitch Bend, Program Change, Etc..). Use the MIDI.set... command to point to the functions you require. This is the function I created to be called when a Midi Note On event is detected. This is the 'meat' of your program. In this test program, I just have it flash the LED on the Arduino board. But you could just as easily have it play a note on your home made Synth circuit, Flash a spotlight on your Midi controlled lighting rig, or even command your Midi controlled Robotic Gorilla to enter 'Rampage' Mode. The sky is the limit. This is the only function in the main loop of the program. It just checks the input buffer for any received Midi commands and passes them to the correct function. 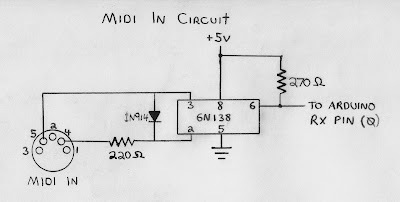 The MIDI standard spells out the circuit that should be used for a MIDI INPUT so lets look at that first. 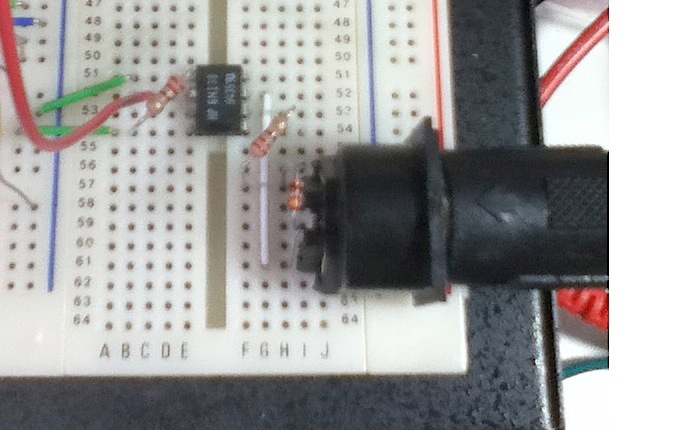 This very simple circuit uses a 6N138 optocoupler chip. This device basically electrically isolates your circuit from the incoming Midi signal. The 1N914 diode protects the chip from an incorrectly wired Midi cable. 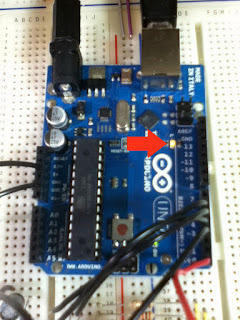 Plug the output of the optocoupler (Pin 6) into the RX (Pin 0) socket on your arduino board. Note: Be sure to correctly identify pin 4 and 5 on the Midi In Jack. Also note that the RX/TX pins and the USB Port on the Arduino Board share the same signals. 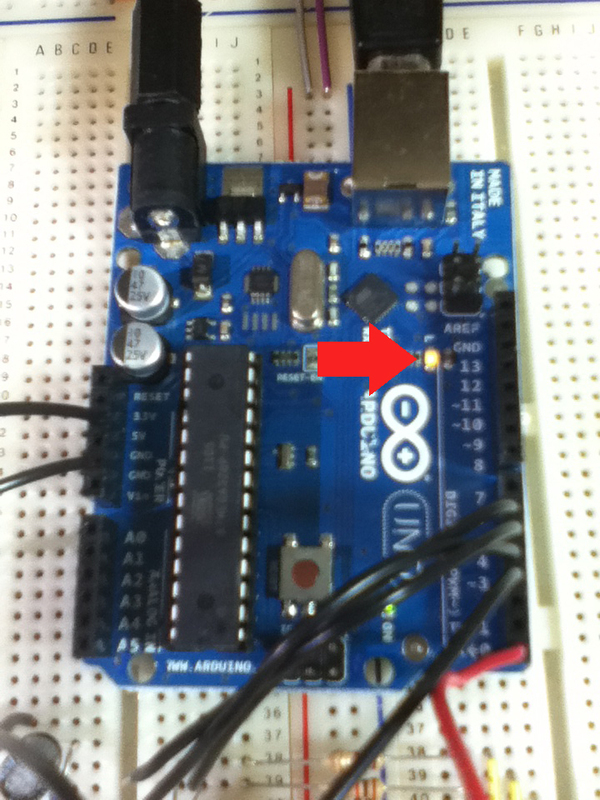 So, you will need temporarily remove the wire from the RX Pin 0 on the Arduino Board to upload a program. Then remove the USB Cable from the computer and replace the RX wire when you run the program with a Midi Input. That's really all there is to it! 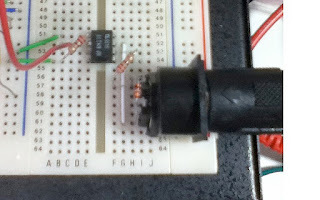 Connect the Midi Out port on a Midi Keyboard to the Midi In Jack on your Arduino. If the little LED next to Pin 13 on the Arduino Board flashes when you hit a key, you are correctly recieving the Midi Data. Have fun! // when a MIDI NOTE ON message is received. MIDI.begin(MIDI_CHANNEL_OMNI); // Initialize the Midi Library. // to respond to channel 2 notes only. // is received. in this case it's "MyHandleNoteOn". MIDI.read(); // Continually check what Midi Commands have been received. Your breadboard diagram has an error. The diode should be at the optocoupler input not at the connector. You are correct! I totally missed that. Thx. Functionally, it should be fine either way but I'll try to correct the diagram soon. I have no idea what i can't seem to get this to work. Is there something I'm missing? I'm more or less following the breadboard diagram since, you know, i'm mostly an idiot. Hi WB. Sorry you're having trouble. What version of the Arduino IDE and Midi Library are you using? I wrote this with IDE .0022 and Midi Library V3.1.1. Are you able to compile and upload the program successfully? Here are a few things to check. Make sure that the pins on your Midi jack are correct. Remember to remove the wire from the Arduino RX pin to upload the program, then replace it to run. Make sure your keyboard is actually set to send Midi data. Let me know if this helps. Hey WB. If you like, send some pictures of your circuit to the email address in the "Contact" tab at the top of the page. I'd be glad to take a look. Hey Dave, Sent it out. If you need anymore photos let me know. I really appreciate you helping with this. I'm running into the same problem with my circuit, did you figure out WB's problem? I believe I fixed his problem. You want to check the orientation of your Midi jack and make sure you have it connected correctly. 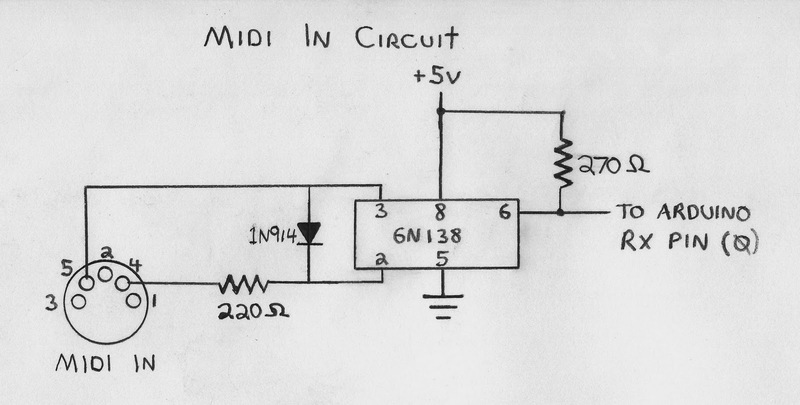 The breadboard diagram picture may be a bit confusing as the Midi jack is shown facing toward you (this was the only midi jack graphic I could find). I added the actual pin numbers in red underneath to try to make it clearer. If you look at the actual picture of the circuit at the top of the page, you can see how the jack is actually oriented on my board. Let me know if this helps. 2. Plug USB into both Uno and development PC. 2. Disconnect Uno from development PC. hey, nice setup! Do you think it could be use to control that kind of strip with midi information : http://www.adafruit.com/products/306 ? Hi jkor. You could easily control that via Midi. Just replace the code inside the "MyHandleNoteOn" function with the code to drive the LEDs. Every time a Midi note is received the MyHandleNoteOn function is called. I think that this rgb led strip looks too weak for a stage show. I'm thinking of using a blinkM/MaxM chain with your Midi IN arduino setup. Do you have example of the http://arduino.cc midi library interfacing with blinkM/MaxM? If i wanted a LED on 12 to light if one note was played, but an LED on 11 to light if another was played, how can I set certain ports to respond to certain channels? Are you trying to track different midi note numbers or midi channel numbers? the recieving part is were I have a lot of questions and read many different things about. Is it possible, with this library, to f.e. recieve a CC(cutoff filter or something) and that it analyses that signal and i can assign the value of that CC to a led that is at is brightest when at 127 and off at 0 using analog out or PWM? and sorry for my bad English spelling..
Every time a CC message is received, the function you specify will be called. The MIDI Library will pass the Channel, Controller Number, and Value of the CC that triggered it to your function. I'll let you figure out setting the LED brigtness function. Good luck with your project! I'll experiment with the code later this day. For what I see from this code it's exactly what I was looking for. thank you !Hope I can get it to work. so I did some test today and i couldn't get the LED to flash when it got MIDI data. -played some notes on my keyboard. and tried several of these steps in different orders. but it won't work.. something I missed? also I noticed when I run any kind of serial sketch on my arduino f.e. serial.print something and I cut the power by removing usb and then plugging it back in it stops the transmission... don't know if this has anything to do with it.. reallly need some help with this, can't figure out what I'm doing wrong. If you can, send some pictures of your circuit to the email address in the "Contact" tab at the top of the page. I'll take a look. I have a school project which receives MIDI messages from an electronic keyboard and program the Arduino to process this and activate pumps to create a water fountain. This is the first time I am doing an electronic project and I am thankful that I found your post which I can use for the first part of my project. I am still researching on the approach for the second part of my project. I understand that MIDI messages can be sent on 16 different channels, how do I determine which channel is used to send MIDI messages from my electronic keyboard to my MIDI jack? In you case, you have set your channel to 2, how do you determine that? Sorry if my questions appear to be very basic as I do not have prior experience with electronic project or Arduino. I will be grateful if you could help me with my queries. Welcome to the blog! That sounds like quite a project you've got going. I'd love to see what you come up with. Your keyboard will have a 'Midi Channel' setting that can be set from 1 to 16 or to OMNI. (OMNI means that it will broadcast on all channels). The idea is that you could have 16 different synths all hooked up you keyboard controller and by changing the channel number, you could select which synth you wanted to hear. On the receiving end, you would set your device to receive Midi commands on a certain channel (channel 2 for example). It would then ignore all information not on channel 2. Thanks, Dave! Will check out my keyboard. You are right! I could get the MIDI channel from my keyboard, it has been preset to '01'. 1) A sketch is stored in the Flash memory of the arduino microcontroller after I have uploaded it to the board from my computer, does it mean there is no need to connnect my USB cable from my computer to the board when I run the sketch on my board? Is it necessary to power my arduino board with an external battery or can the board run on its own? 2) Can the board be uploaded with several sketches? Or does it keep only the latest one uploaded? 2) The Arduino can only store one sketch at a time. I am going to start creating the circuit and arduino sketch but I have problem locating your codes from the MIDI library which I downloaded. All I could get is '#include ' when I accesses the MIDI folder. Is there somewhere else that I can find your codes? You have mentioned that RX0 must be disconnected when uploading program to arduino. After uploading the program and reconnecting RX0, can I also reconnect the USB cable to power the arduino? Or do I have to use an external power source such as a battery pack? 1) You don't have to access the MIDI folder. Just install it to the Arduino Library as described. Then forget about it.. Copy and paste the code at the end of my article into a new sketch and upload. 2) You can leave the USB cable plugged in. Just unplug the RX0 wire when you upload sketch and plug back in to run. If the Arduino is receiving MIDI data while trying to upload a sketch they will conflict and your sketch will not upload. I have done the circuit and uploaded the sketch to arduino but not getting any response. I have emailed some photos to you, grateful if you could tell me what I have done wrong. I used the schematic above for a MIDI project I'm working on. The pinout on the MIDI jack is weird, I had to reverse the connections for pins 4 and 5 to get it to work at all. And then I kept getting random read failures (the serial reads were getting the wrong values). Eventually I figured out that I needed to tie ping 7 of the optoisolator to ground with a 1k resistor, now it works perfectly. Total NOOB here. Question: I only want to receive Program change messages and have the arduino turn off/on leds or relays with them. Is this the blog to learn how to do this? Or is it easier just to program the arduino to do something when it gets 0xC0 and not include the midi library? big thanks!! great blog!! MIDI.setHandleNoteOff(MyHandleNoteOn); would fix the code. Hi Dave, how would you make this listen to say 8 different midi notes, would you have to set a different name for each, any chance of posting a quick example? Also do you have to set note offs to turn LEDs off? Hi BBBB. Parsing incoming MIDI data is pretty straight forward (with a couple of exceptions). When the MIDI Library receives Note Data, it will call the function you set and pass a Channel number, a Note Number, and a Velocity number. Your function can use these numbers to play the correct note on your sound source (whatever that may be). In my sample code I used a note with Velocity=0 as a note off (turn the light off). It keeps the code simpler for this example. You just need to keep track of the notes that are playing and make sure they get shut off when the key is released. Check out my NaV-1 project to see how I coded this for a Mono Synth. One thing you need to account for is if someone holds a key down, then presses and releases a second key. The code should remember the original key and re-trigger it (think of a trill between two keys). Kind of hard to describe this in a comment so I hope it makes some sense. Good luck! Can I use a diode with the part number 1N914TR? Hi Beni. Yes you can. The "TR" just stands for Tape & Reel which means that the parts come stuck together on a long tape instead of individually packaged. Also make sure you check out the updated version of this article before you start! Can I use a diode with the part number 1N4148 ? I got the part and TR wasn't anywhere on the packaging! Thanks for the tip, I think a lot of my frustration with finding parts as a newbie is there are a lot of added letters and no resources to find out which ones are important. Can I recommend a blog post about that? Also, I got the MIDI circuit working by following the video. Do I not need to ground the input? Hi Beni. Electronic part numbers are generally meant for manufacturers and not intended to be hobbyist friendly. Search for the data sheets for parts and there should be a break down of the part codes. The ground on a MIDI input is left unconnected. It is only grounded on the MIDI output side. This prevents "ground loops" between the two instruments. Hi Jack. I have not tried a 6n139 for this but have read that it has worked for other people. Good luck. This is the first time I am doing an electronic project and I am thankful that I found your post which I can use for the first part of my project. I am still researching on the approach for the second part of my project.Microsoft Customer Service is here for you if you have any issue. This information is so nice about Arduino Midi Input Basics and hope that we will get more new updates regarding this post. Any antivirus security issues then visit or read Kaspersky Antivirus Blog to get the best solutions by the experts available on 24/7 time. Thanks for sharing this post, very informative. I have really liked your write-up.